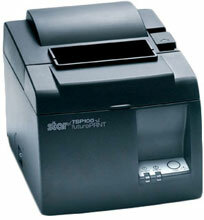 Star TSP100: TSP113 - Thermal, Tear bar, USB interface. Includes USB and Power cables. Color: Gray. (Formerly sold as TSP113U GRY). Also known as TSP113U GRY US. The Star TSP113 features everything all in one box! The TSP113 package includes the printer, USB and power cords, receipt design software and all software drivers, making this receipt printer the easiest to set up and begin using. The TSP113 features 203 dpi resolution, 3.15" paper width and a 25 receipt-per-minute print speed even when printing graphics. Use the included software to preview receipts before printing, add coupons and logos to receipts, remove unwanted white space and enhance barcode printing. The Star TSP113 does it all straight out of the box! The Star 39461510 is also known as Star Micronics	39461510	.